Oh praise the greatness of our God! In 2 Samuel 22:31 we read King David saying “As for God his way is perfect, the word of the Lord is flawless”. This same theme is repeated in Psalm 18:30. Skipping to the New Testament, we discover that Romans 1:20 states God has revealed his nature in the Creation and He did it so we would have no excuse to cease worshipping Him. This same Creator is declared in Genesis to have ceased from His creating acts at the end of the sixth Day. All of which points to the problems you have in claiming that the God of the Bible used evolution. There is no way around it; evolution is a continuing physical mechanism that requires error or imperfection to enable life to evolve. It is anything but perfect. God’s nature is perfect. Evolution never claims to be. Evolution as a mechanism can therefore never be a picture of the real Creator portrayed in the Bible. Never forget that mutations, or defects in the genetic code, are actually ‘required’ in order for natural selection to supposedly drive evolution, so mindless chemicals evolve into mindful men who ask such a question as this. Such mutations are caused by breakdowns in the environment such as damage by ultra-violet and other radiation, genetic copying errors and various other defects in genes, which in many cases lead to death of the organism, or serious disease or loss of function. None of these fit the picture of “perfect.” So it’s a no brainer really; any system requiring a process based on error is contradictory to the very nature of the Creator God revealed by the phrase “All his ways are perfect”. Not just some, not most, but all! For those of you concerned with the ‘technical’ meaning of the original Hebrew in Deuteronomy, translated perfect in English, here’s what you find. The Hebrew word translated “perfect” in Deuteronomy 32 is tamiym. This word is used many times in the Old Testament, and although it is not always translated as “perfect”, in every case it means healthy, wholesome, sound (as in good condition), complete, or innocent and upright. For example, it is the word translated as “without blemish” or “without defect” (depending on the translation) to describe animals that are acceptable sacrifices to God. These descriptions cannot be applied to the process of evolution by mutation and natural selection. Evolution is a process of struggle, trauma and disease, with unfit organisms, (i.e. the unwholesome and unhealthy), battling to survive against the fit, who cannot be described as innocent and upright if they deliberately destroy the less fit. Such an ugly world of incomplete, unhealthy creatures is totally incompatible with God’s character. So if you still want your god to be the author of evolution, then you are not talking about the God who is Jehovah, who is Jesus, who is the Holy Spirit who is introduced to us in Genesis 1. This, the only true God, could never use a system based on faults in genes, resulting from corruptions that normally kill or maim, just to drive his creation, which He would hypocritically, in the end, label as “good”. All of us, who have lived since Adam sinned against God, dwell in such an environment and we know it isn’t good at all. In reality calling God the “Ultimate Evolver” is Heresy or Syncretism of the worst sort. You may also wish to consider a legal side to this question. When it states in the Deuteronomy passage that “all his ways are just”, can we really say any God is just if he instituted a system of ‘creation’ via evolution which uses undeserved suffering in many creatures as a means of achieving a currently undefinable end? The final result of such logic is to remove all meaning from words such as law or justice, compassion or mercy, which leaves you exactly where people such as Hitler, Stalin or Mao wanted you. In addition, the 2 Samuel passage refers to “the Word of the Lord being flawless”. From John 1, we know that the Word of the Lord is actually Jesus Christ, who is also identified as the Creator. If he is flawless, then his nature is not reflected by any method which uses a system of flaws in the genetic code to drive his still unfinished ever evolving creation? It is illogical. Our flawless creator whose “ways are just and perfect, created a perfect world “very good” which truly reflected his ‘very good’ nature. Sadly this original world was ruined by us, originally through the wilful choice of the first man Adam to sin, or rebel against our Creator, and by each of us after that. As a result it has been downhill tooth and nail ever since, and it has been only after man sinned that mutations, disease, death and struggle entered the world. The one bit of outstanding good news is that the Perfect God became the Perfect Christ who alone is the Perfect Saviour for any who would repent of their rebellion against him (which includes labelling Him as the “Grand Evolver”). So how about you join us in praise to our God who is the risen Christ for all his ways are indeed perfect. Trust in him as Saviour, so you can then look forward in great anticipation to the restored creation where such errors are eliminated, and where the impacting sources in the failing, sin affected environment of our world are removed forever. A School Chaplain claims students lose faith unless we teach God used evolution. How do you reply? Answer here. Did God use Evolution? Human Genome expert Dr Francis Collins says so. Answer here. Why is evolution so popular among theologians when creationists have exposed its errors? Answer here. 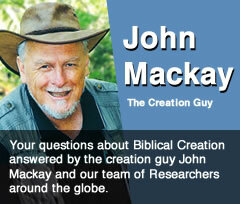 Isn’t the creation evolution debate just science versus religion? Answer here.